Pearl Jam will take the stage at the iconic Maracanã Stadium on March 21, 2018 with openers Royal Blood. This show is in addition to the previously announced South America Lollapalooza headlining dates. Find the current tour schedule here. A Ten Club pre-sale for all eligible members will be held Nov 6-7. For more details go here. $3 USD from each ticket sold is a charitable contribution to the Vitalogy Foundation, a United States public charity under I.R.C. section 501(c)(3) and 509(a)(1). The Vitalogy Foundation supports non-profit organizations doing commendable work in the fields of community health, the environment, arts and education and social change. Hi! Could someone please confirm my understanding that 'only Brazilian Ten Club members can purchase tickets to this show online'? how about a US tour??? Pre-sale tickets will be available in all price levels except for Box seats. All seated tickets are GA (general admission) within the seating section you choose. There are no assigned seats, they are first-come, first-served. Tickets for Fun website does not accept orders from outside Brasil. 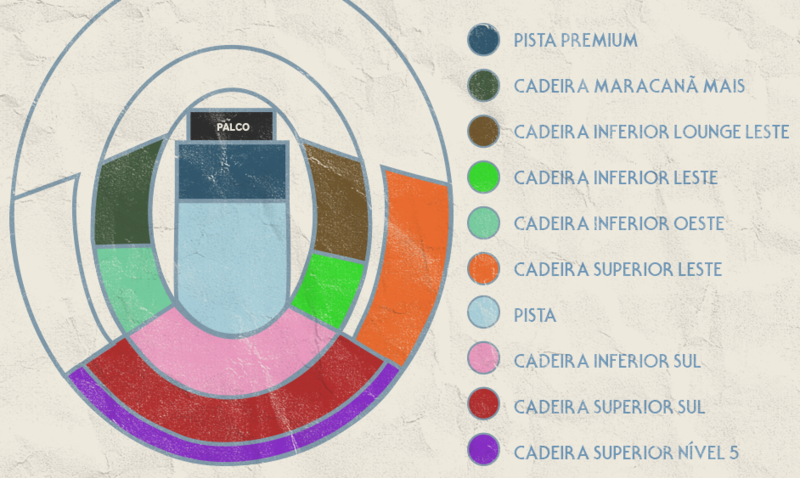 Purchasing tickets through the Tickets for Fun website is restricted to Brasilians only. However, Tickets for Fun will accept international orders by phone Nov 6-7 from 11am-5pm BRT by calling 55 11 2106 9421. We advise you not to purchase flights until after you have purchased tickets. Tickets are not guaranteed. Curious if anyone has experience purchasing tickets via international phone call for potential language barriers. Always wanted to go to Rio. This could be a great reason! It can be done and has been done. Pick up the phone! Let's hope Tickets For Fun is a bit more organized this year! I made up my mind and I'm definitely attending this show. Hopefully it won't be a nightmare getting pre-sale tickets over the phone. is the pre-sale starting at 8:00 AM BRT as the email states or 10:00 AM? not accepting my password code.....anyone have any success? when i called the info line already said 10c tix are sold out. anyone else understood the same or was my connection that bad and i understood it completely wrong? When I dialled the number ahead of the tickets going on sale (just to check I would be calling the right place) it said "sold out" but this was about 3 days before they went on sale so I am guessing its just an automated message when there are zero tickets available whether they have been released yet or not (similar thing happened before the O2 arena show in London). Phone up at exactly the opening time for international ticket sales today and have been on hold for the past 27 mins. God knows what this is going to do to my phone bill. Going to give it up to the one hour point on the international ticket sales line before I give up. Annoyingly it doesn't give any indication of how far down the queue you are. I dialled at the exact moment the lines opened and haven't been able to get through yet. Ok, so if 10c tickets are sold out we should wait till November 10th and buy throguh the phone call? I am so angry! How can tickets be sold out so fast? It's so unfair to international customers, that phone line is impossible, why can't they just let us also buy online like in other countries? WHY!!!!! I still did not get my email with the password. What could have happened? can anybody help me? On the page there are also tickets with the discount sold out? that explains everything. You dont need to know the number of 10c members in brazil to know they will get a lot of them..